Sir Allen Lane was a British publisher who founded Penguin Books. He brought high quality paperback fiction and non-fiction to the mass market. Allen Lane Williams was born on 21 September 1902, in Bristol to Camilla (née Lane) and Samuel Williams, and studied at Bristol Grammar School. In 1919 he joined the publishing company Bodley Head as an apprentice to his uncle and founder of the company John Lane. In the process, he and the rest of his family changed their surname to Lane to retain the childless John Lane’s company as a family firm. He rose quickly in the business becoming managing editor in 1925 following the death of his uncle. After conflict with the board of directors who were wary at first — for fear of being prosecuted — of publishing James Joyce’s controversial book Ulysses, Lane left in 1936 to set up Penguin Books. The legend goes that on a train journey back from visiting Agatha Christie in 1934, Lane found himself on a station platform with nothing available worth reading. 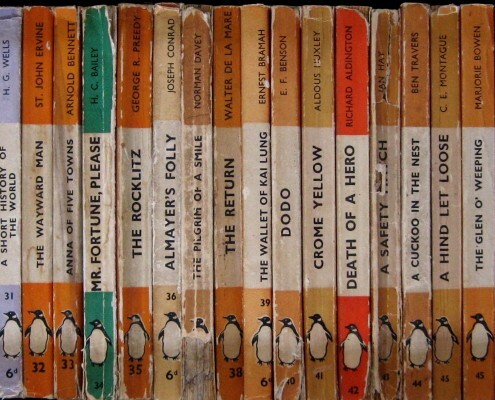 He conceived of paperback editions of literature of proven quality which would be cheap enough to be sold from a vending machine; the first was set up in Charing Cross Road and dubbed the “Penguincubator”. Lane was also well aware of the Hamburg publisher Albatross Books and adopted many of its innovations. The paperback venture was extremely successful, and he expanded into other areas such as the Penguin Classics in 1945. Lane married Lettice Lucy Orr on 28 June 1941 and they had three daughters. He was knighted in 1962 and died in 1970 at Northwood, Middlesex. The Allen Lane Foundation was formed in 1966, with the Trustee Deed signed on 14th March. The trust was set up with 100,000 shares in Penguin, valued at around £150,000. There were three Trustees and a broad remit for funding. Trustees met three times a year and made small grants to small projects across the country. The Foundation was keen to ensure that its small grants were made with best effect and in the most constructive way. It aimed to make a lasting difference in the lives of the people it helped to support. Over the years, Trustees developed a policy of funding projects which were deemed ‘unpopular’ in society. In addition to its general grant-making, the Foundation has, in the past, funded some particular programmes of work including support for penal reform and women’s projects in the Republic of Ireland. It has also made some larger-scale grants for specific work on a national scale. Previously located in London and then Bracknell, for the past 17 years, the Foundation’s offices have been in York. 2016 was the Foundation’s 50th anniversary year and a Lecture was given by Dame Anne Owers in celebration.